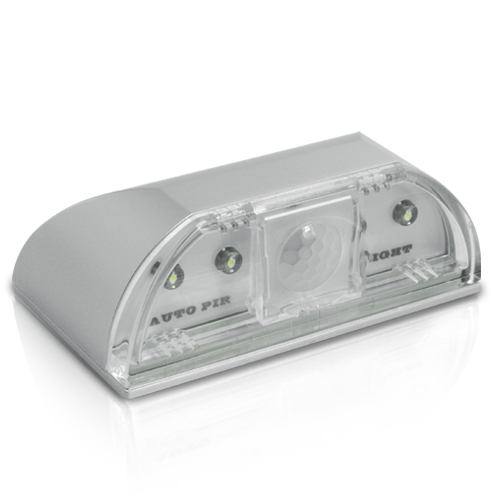 Successfully Added Mini LED Light - Motion Detection to your Shopping Cart. Light up a dim porch, undercabinet, or garage without needing to flip a light switch with this mini motion detection LED light. Upon detecting movement within a 60-degree angle and a 3 meter range, the light switches on and stays illuminated until the sensor detects no motion for around 8 seconds. This LED mini light is super easy to install! To install a recessed downlight, you need to cut a hole in your ceiling; a track fixture, or a cable light, you need to install a conductible system. It takes a qualified electrician to install these lighting fixtures and it will definitely cost you extra money. With this mini LED light even a three year old can install it. Just attach the included double-sided sticky tape to the back of the fixture, then place it where you want. Just as easy as that. The puck light features a low profile and a simplistic design. The polished plating color and small size of the fixture makes it fit effortlessly into your modern home décor. Why buy an expensive brand name lighting fixture when you can use this mini LED light to achieve the same effects? This practical little lighting fixture is now available in our warehouse for single or bulk purchase. Order your sample today and we will ship it out within one day. Brought to you by your source of China factory direct electronics, Chinavasion. No heat, perfectly safe to mount anywhere. Excellent little night light. I gave two to an older widow who told me she loves them as she located them between her bed and the bathroom, lighting her way during those late night dark visits. Would be nice if it were water proof. Have huge potential for outdoor installation. I totally enjoyed and was satisfied with it. Great gadget for basements specially for light switches, drawers and cupboards. Totally satisfied with it. I installed one beside my bed and one in my closet. It is perfect for basement lighting too. I am planning to buy more for my friends.